This article shows you how to verify a VPN gateway connection for both the classic and Resource Manager deployment models. To verify a VPN gateway connection for the Resource Manager deployment model using PowerShell, install the latest version of the Azure Resource Manager PowerShell cmdlets. To verify a VPN gateway connection for the Resource Manager deployment model using Azure CLI, install the latest version of the CLI commands (2.0 or later). You can verify that your connection succeeded by using the az network vpn-connection show command. In the example, '--name' refers to the name of the connection that you want to test. When the connection is in the process of being established, its connection status shows 'Connecting'. Once the connection is established, the status changes to 'Connected'. 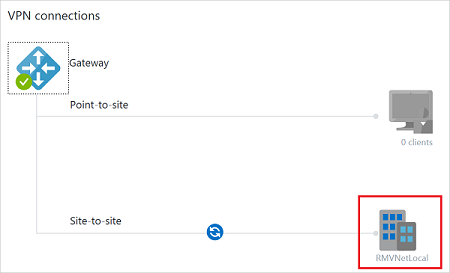 In the Azure portal, you can view the connection status for a classic VNet VPN Gateway by navigating to the connection. The following steps show one way to navigate to your connection and verify. 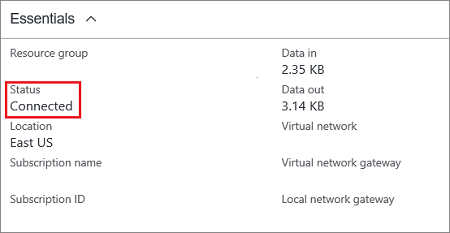 In the Azure portal, click All resources and navigate to your classic virtual network. On the virtual network blade, click Overview to access the VPN connections section of the blade. On the VPN connections graphic, click the site. On the Site-to-site VPN connections blade, view the information about your site. To view more information about the connection, click the name of the connection to open the Site-to-site VPN Connection blade. To verify your VPN gateway connection for the classic deployment model using PowerShell, install the latest versions of the Azure PowerShell cmdlets. Be sure to download and install the Service Management module. Use 'Add-AzureAccount' to log in to the classic deployment model. 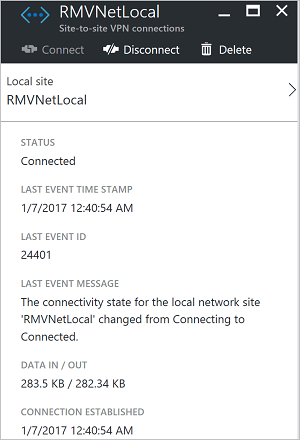 You can verify that your connection succeeded by using the 'Get-AzureVNetConnection' cmdlet. Use the following cmdlet example, configuring the values to match your own. The name of the virtual network must be in quotes if it contains spaces. After the cmdlet has finished, view the values. In the example below, the Connectivity State shows as 'Connected' and you can see ingress and egress bytes. You can add virtual machines to your virtual networks. See Create a Virtual Machine for steps.